Rooftop Reviews: Happy Birthday Grant Pensinger! 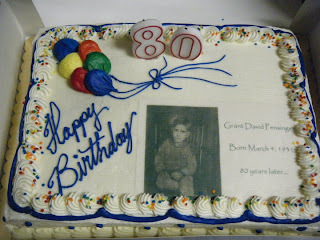 Grant Pensinger, Sue's Dad, was 80 years old yesterday, and celebrated it with a big party in Westminter, Maryland today. About 80 people showed up, and Grant was clearly delighted with the attention, and affection, with which he was showered. Happy 80th Grant! See you at the next one!